Background Limited information is available on the variation in injury rates over multiple seasons of professional football. Aim To analyse time-trends in injury characteristics of male professional football players over 11 consecutive seasons. Methods A total of 1743 players comprising 27 teams from 10 countries were followed prospectively between 2001 and 2012. Team medical staff recorded individual player exposure and time loss injuries. Results A total of 8029 time loss injuries were recorded. The match unavailability due to injury was 14% and constant over the study period. On average, a player sustained two injuries per season, resulting in approximately 50 injuries per team and season. The ligament injury rate decreased during the study period (R2=0.608, b=−0.040, 95% CI −0.065 to −0.016, p=0.005), whereas the rate of muscle injury (R2=0.228, b=−0.013, 95% CI −0.032 to 0.005, p=0.138) and severe injury (R2=0.141, b=0.015, 95% CI −0.013 to 0.043, p=0.255) did not change over the study period. In addition, no changes in injury rates over the 11-year period were found for either training (R2=0.000, b=0.000, 95% CI −0.035 to 0.034, p=0.988) or match play (R2=0.282, b=−0.015, 95% CI −0.032 to 0.003, p=0.093). Conclusions The injury rate has decreased for ligament injuries over the last 11 years, but overall training, match injury rates and the rates of muscle injury and severe injury remain high. The injury rate (IR) in professional football is estimated to be approximately 1000 times higher than the overall rate for typical industrial occupations generally regarded to be high risk.1 In 1999, the Union of European Football Associations (UEFA) initiated a research project aimed at reducing the number and severity of injuries and increasing player safety. This ongoing study, the so-called UEFA Champions League (UCL) injury study, has thus far involved 27 European top-level football teams from 10 different countries over 11 seasons. A previous report showed that a professional football team of 25 players can expect roughly 50 injuries, causing time loss from play each season.2 This means that, on average, 12% of the squad was unavailable to train and play matches due to injury at any point during the season in that study. The recent literature has been somewhat contradictory regarding potential changes in IRs among professional footballers during the 2000 s.2 ,7 In a previous 7-year follow-up of the UCL injury study, no apparent changes were found in the training and match IRs over time,2 whereas another study of the Norwegian premier league reported an increased acute match IR during the six-season study period.7 Therefore, the objective of this study was to analyse time-trends (between-season variations) in the injury characteristics over the last 11 years in more detail. Our hypothesis was that general IRs have been stable over time. The study design followed the consensus on definitions and data collection procedures for studies of football injuries outlined by UEFA8 and in the consensus document for football injury surveillance studies.9 To ensure high reliability of data registration, all teams were provided with a study manual containing definitions and data recording procedures, including fictive examples. The manual and study forms were translated by experienced translators from English into five other languages: French, German, Italian, Russian and Spanish. Player baseline data were collected once a year at the time of player inclusion. Individual player participation in training and matches (minutes of exposure) was registered by the club contact person on a standard exposure form. The collected information included exposure on the first and second teams, as well as any national team exposure. The team medical staff recorded injuries on a standard injury form that provided information about the diagnosis and the nature and circumstances of the injury. All injuries resulting in a player being unable to fully participate in training or match play (ie, time loss injuries) were recorded. The player was considered injured until the team medical staff allowed full participation in training and availability for match selection (table 1). Injuries were categorised under four degrees of severity based on the number of days absent. All injuries were followed until the final day of rehabilitation. The Orchard Sports Injury Classification System was used to classify specific injuries.10 Injury and exposure forms were sent to the study group on a monthly basis. Reports were checked upon receipt by the study group and prompt feedback sent to the teams in order to correct any missing or unclear data. Supplementary online-only files 1 and 2 show the study design and the forms used and also the manual with practical instructions. All contracted players in the first teams were invited to participate in the study on a voluntary basis. Players who left the team during the season (eg, due to transfer) were included for their time on the team. Fewer than five players declined participation during the study period. Continuous data are presented as a mean with the corresponding SD. Lay-off times are presented as a median with corresponding IQR. IRs were calculated as the number of injuries/1000 h with corresponding 95% CIs. The injury burden was calculated as the number of lay-off days/1000 h. IRs were compared using a rate ratio (RR) and significance tested using z-statistics.11 Seasonal trends, expressed as the average annual percentages of change, were analysed using linear regression with the log-transformed IR as the dependent variable. In addition, a 2-year moving average (MA) approach summarising two consecutive seasons was used to visualise a smoother seasonal variation. Time-trend analyses were performed on training and match injuries as well as on the two most common injury categories (ligament and muscle injuries) and severe injuries. All analyses were carried out on two levels, including all teams or only the four ‘core’ teams. Analyses were two-sided and the significance level was set at p<0.05. Each team had an average of 25 players. The size of the contracted first team squad increased during the study period, from 23±2 players during the 2001/2002 season to 26±3 players during the 2011/2012 season (p=0.003). Among the four ‘core’ teams participating in all the seasons, the squad size did not change (from 25±2 to 27±5 players, p=0.451). In total, 1 057 201 h of exposure (888 249 h of training, 168 952 h of match play) were recorded. As illustrated in table 2, the training attendance and match availability barely fluctuated between seasons, with a mean training attendance of 77% (range 75–79) and a mean match availability of 86% (range 84–88). The mean training attendance and match availability for the four ‘core’ teams were 74% (range 70–78) and 85% (range 83–87), respectively. In total, 8029 injuries were documented, with 4546 (57%) occurring during matches and 3483 (43%) during training. Players sustained two injuries per season on average, which is equivalent to 50 injuries per season for a team of 25 players. The total IR based on all teams and all seasons was 7.6/1000 h (95% CI 7.4 to 7.8). The match IR was almost seven-times higher than the training IR (26.7 vs 4.0/1000 h, RR 6.7, 95% CI 6.4 to 7.0, p<0.001). The training and match IRs per season across the 11-year study period are shown in figures 1 and 2. No seasonal changes were found in the IRs for training (R2=0.000, b=0.000, 95% CI −0.035 to 0.034, p=0.988) or match play (R2=0.282, b=−0.015, 95% CI −0.032 to 0.003, p=0.093). Similar results were found in the MA IRs for training and match play, with annual decreases of 0.3% and 1.7%, respectively. Analysis of the four ‘core’ teams indicated a decrease in the match IR of approximately 3% (R2=0.550, b=−0.026, 95% CI −0.044 to −0.008, p=0.009), but no trend was found for the training IR (R2=0.097, b=−0.007, 95% CI −0.036 to 0.021, p=0.572). The MA approach with the ‘core’ teams resulted in similar findings, with an annual decrease in the match and training IRs of 2.3% and 0.9%, respectively. 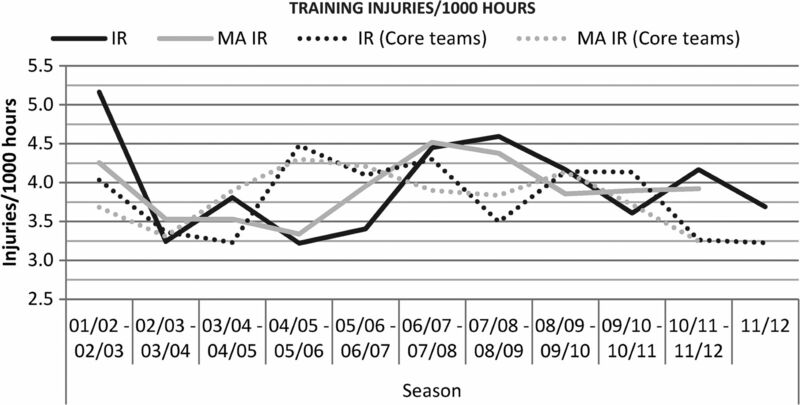 Seasonal variation in training injury rates among male professional football players. 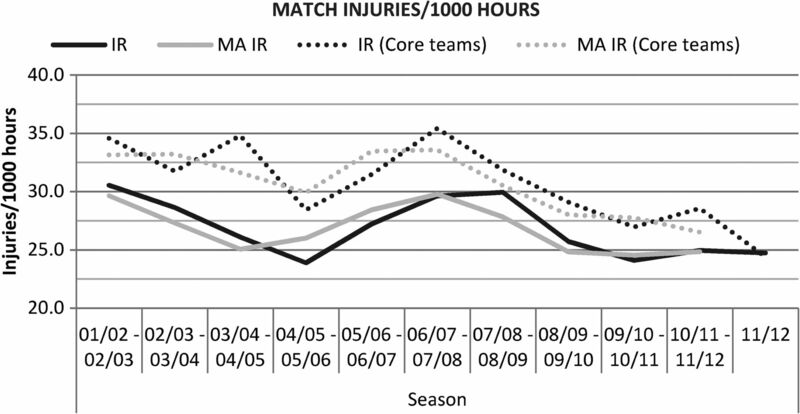 Seasonal variation in match injury rates among male professional football players. The ligament IR decreased during the study period (R2=0.608, b=−0.040, 95% CI −0.065 to −0.016, p=0.005), whereas the muscle IR was stable across seasons (R2=0.228, b=−0.013, 95% CI −0.032 to 0.005, p=0.138). The MA approach found an annual decrease in the ligament and muscle IRs of 3.6% and 0.7%, respectively (figures 3 and 4). The four ‘core’ teams followed the same pattern as the total cohort, with a seasonal trend of a decreasing ligament IR (R2=0.727, b=−0.066, 95% CI −0.096 to −0.035, p=0.001) and no decline in the muscle IR (R2=0.147, b=−0.012, 95% CI −0.033 to 0.010, p=0.244). In line with these trends, the ligament IR exhibited an annual decrease of 4.8% with the MA approach, and the muscle IR exhibited a slight increase of 0.3%. 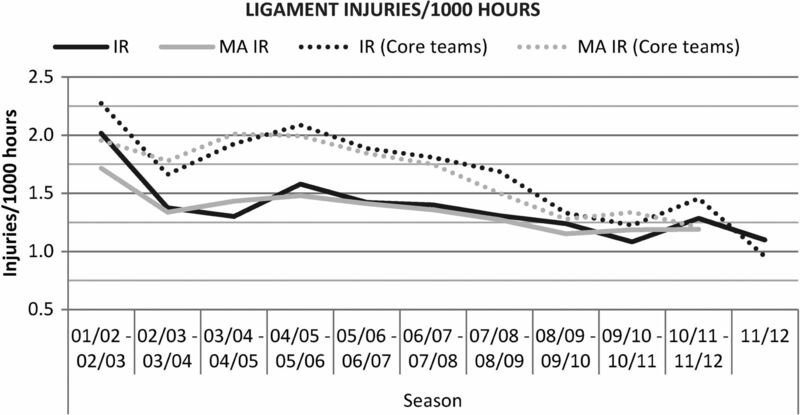 Seasonal variation in ligament injury rates among male professional football players. 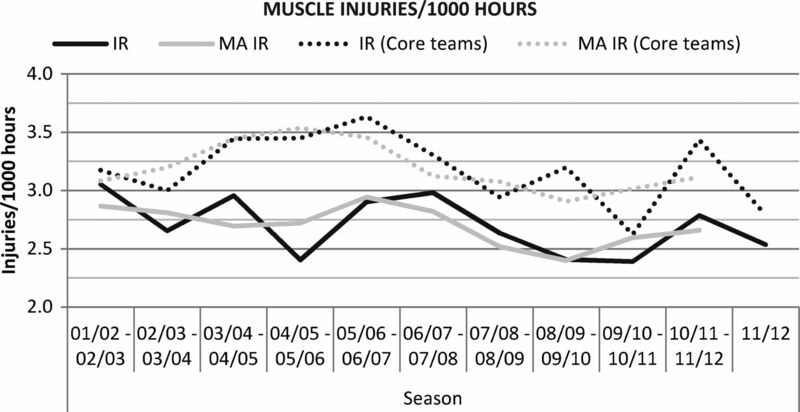 Seasonal variation in muscle injury rates among male professional football players. Severe injuries accounted for 17% of all injuries; suggesting that an average team at this playing level can expect approximately eight severe injuries per season. The severe IR remained fairly constant over the study period (figure 5) and exhibited no significant trend (R2=0.141, b=0.015, 95% CI −0.013 to 0.043, p=0.255). The annual increase in the severe IR was 0.8% based on the MA approach. Analysis of the four ‘core’ teams revealed a similar result for severe injuries in the regression model (R2=0.078, b=0.015, 95% CI −0.023 to 0.053, p=0.406), but a somewhat higher annual increase of 2.2% with the MA approach. 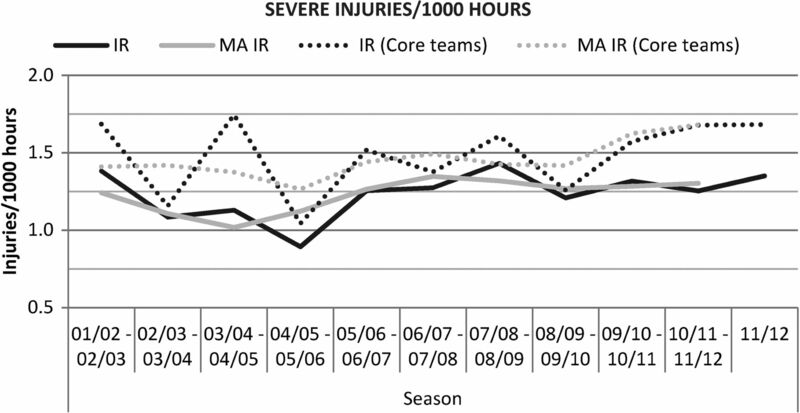 Seasonal variation in severe injury rates among male professional football players. Table 3 gives the 15 most common injury subtypes with regard to their frequency and lay-off time. This injury list covers more than 60% of all injuries that a team medical staff will encounter during a season. The main finding in this study was that the IR among male professional football players decreased significantly for ligament injuries over the last 11 years, but that training and match IRs and muscle and severe IRs remain high, exhibiting no decrease over the study period. Our finding that muscle and severe IRs remain at the same level as 11 years ago is disappointing because injury prevention is essential for both the maintenance of player health and team performance. Theoretically, prevention of muscle injuries and severe injuries could have been increasingly effective over the study period, but the preventive effect was counteracted by an increased intensity of the game over the years. However, we were not able to find any studies indicating such changes during the 2000 s for these top-level teams. Studies on a professional level have shown that injuries negatively correlate with a team's results and success.4 ,5 Fortunately, several studies have shown that prevention is possible, at least at the amateur and youth levels, through the implementation of multimodal interventions with male amateur and youth football players19 ,20 or specific neuromuscular warm-up programmes (predominantly for youth female players).21 ,22 However, the programme, ‘The 11’, had no effect on the overall IR or injury severity in male amateur players.23 Thus far, no similar multimodal or neuromuscular preventive programmes have been tested in randomised controlled trials exclusively at the professional level, and carrying out randomised trials at this level might be difficult. However, the results from the present study indirectly suggest that prevention methods at the professional level have thus far only been effective for ligament injuries. Although all the aforementioned programmes are probably well known to members of the medical staff, it is the coaching staff who decide on training content, and coaches may not always be prepared to devote training time to preventive programmes. In addition, the applicability of these evaluated interventions to professional footballers can be questioned. Do the available preventive programmes offer enough tissue stimulus for professional players? Football is a high-intensity sport characterised by continuous changes in direction and high-load unipodal actions.23 Speed is a key element in elite football as players have less time and space for their actions. Football training, including preventive methods, should be football-specific and mimic the actions in matches to be effective. However, many of the neuromuscular injury prevention programmes are basically static or have very controlled dynamic movements and might not offer a sufficient stimulus to achieve measurable preventive effects at the professional level where the velocity of player actions is high.21–24 On the other hand, such programmes may be effective at preventing ankle and knee ligament injuries,21 ,22 ,24 but less effective at preventing muscle injuries, which could explain why the ligament IR, but not muscle IR, decreased in the present study. Targeting player factors: Not enough for injury prevention? Many preventive programmes focus on internal risk factors by providing the players with programmes aimed at increasing person-related skills, such as strength, balance, coordination and flexibility.21–28 However, studies of the internal risk factors for injuries in male elite football have reported only increasing age and previous injury as significant risk factors for new injury.3 Neuromuscular training programmes may have greater effects in youth players because they have not yet established their basic movement patterns.21 ,23 In contrast, professional footballers already have a high physical standard, and additional non-football-specific (without the ball) physical training may not be as effective due to a ceiling effect. The multifactorial nature of injuries within the game has led clinicians to segmentalise the problem and break down programmes into components, such as strength, flexibility, core stability and proprioception, sometimes with little resemblance to the football-specific player actions and movements. External factors, such as player load and match frequency, might be important mechanisms underlying injuries.29 The training load on players is traditionally decided by the coaching staff, whereas the long-term load, such as planning the season, number of matches and promotional activities, is normally decided by the board in cooperation with the coaching staff, but usually without influence from the medical staff. The overall training load is the sum of the football training and fitness training. These two programmes are often run by different members of the coaching and fitness staff, and good internal communication is important in order to monitor and adapt the load on individual players. Other factors, such as consistency and the stability of the club in terms of coaching, medical staff and management, as well as the playing style of the team, could also be important external factors to consider in injury prevention. Therefore, decisionmakers (eg, coaches and managers) could play important roles in injury prevention and be decisive for the overall injury situation in a club, but such external factors have not yet been evaluated in injury studies. A lack of continuity in management, coaching and medical teams could be hypothesised to be factors related to injuries, but player transiency might also be influential. In the modern football community, players frequently move to new clubs and are therefore exposed to different training environments, training and match loads and climate conditions. The strength of this study is the substantial dataset obtained from a homogeneous group of male professional footballers. Data recording followed international consensus agreements on procedures for epidemiological studies on football injuries.8 ,9 Importantly, no golden standard exists for the statistical methods used to evaluate time-trends in injury characteristics over multiple seasons. The present study primarily used a linear regression with log-transformed IRs as the dependent variable, but as a ‘sensitivity analysis’, a 2-year MA approach was also used. In general, the two methods presented similar findings, showing that the dataset and the observed time-trends are robust. What are the new findings? The ligament injury rate (IR) in European male professional football decreased during the 2000s. Total IRs for training and matches, as well as for muscle and severe injuries, remain high without a decrease. How might the study impact clinical practice? Preventive actions targeting player-related risk factors might not be enough at the professional level, except possibly for ligament injuries. External risk factors, such as training load, playing style and continuity of club medical and technical staff, should be considered in injury prevention and be investigated further. The authors wish to thank the participating clubs, medical staff and players. We also acknowledge the valuable contributions from Paul Balsom, Performance Manager National A Team Sweden; Dave Rennie, Head Physiotherapist of Leicester City FC and Raymond Verheijen, World Football Academy.
. Evaluating the level of injury in English professional football using a risk based assessment process. Br J Sports Med 2002;36:446–51.
. Injury incidence and injury patterns in professional football: the UEFA injury study. Br J Sports Med 2011;45:553–8.
. Risk factors for injuries in football. Am J Sports Med 2004;32:5S–16S.
. Incidence, severity, aetiology and prevention of sports injuries. Sports Med 1992;14:82–99.
. Methods for epidemiological study of injuries to professional football players: Developing the UEFA model. Br J Sports Med 2005;39:340–6.
. Consensus statement on injury definitions and data collection procedures in studies of football (soccer) injuries. Br J Sports Med 2006;40:193–201.
. Orchard Sports Injury Classification System (OSICS). Sports Health 1993;11:39–41.
. Incidence of injury in indoor soccer. Am J Sports Med 1994;22:364–71. Waldén M, Hägglund M, Ekstrand J. Time-trends and circumstances surrounding ankle injuries in men's professional football: an 11-year follow-up of the UEFA Champions League injury study. Br J Sports Med 2013. In press.
. Diagnosis, treatment and prevention of ankle sprains: an evidence-based clinical guideline. Br J Sports Med 2012;46:854–60.
. What is the evidence for rest, ice, compression, and elevation therapy in the treatment of ankle sprains in adults? J Athl Train 2012;47:435–43.
. Prevention of anterior cruciate ligament injuries in soccer. A prospective controlled study of proprioceptive training. Knee Surg Sports Traumatol Arthrosc 1996;4:19–21.
. Prevention of ankle sprains. Am J Sports Med 1985;13:259–62.
. Comparison of 3 preventive methods to reduce the recurrence of ankle inversion sprains in male soccer players. Am J Sports Med 2007;35:922–6.
. Prevention of soccer injuries. Supervision by doctor and physiotherapist. Am J Sports Med 1983;11:116–20.
. Prevention of soccer injuries: a prospective intervention study in youth amateur players. Am J Sports Med 2002;30:652–9.
. Comprehensive warm-up programme to prevent injuries in young female footballers: cluster randomised controlled trial. BMJ 2008;337:a2469.
. Prevention of acute knee injuries in adolescent female football players: cluster randomised controlled trial. BMJ 2012;344:e3042.
. Effectiveness of an injury prevention programme for adult male amateur soccer players: a cluster-randomised controlled trial. Br J Sports Med 2012;46:1114–18.
. Effectiveness of a neuromuscular and proprioceptive training program in preventing anterior cruciate ligament injuries in female athletes: 2-year follow-up. Am J Sports Med 2005;33:1003–10.
. Preventing injuries in female youth football—a cluster-randomized controlled trial. Scand J Med Sci Sports 2008;18:605–14.
. Prevention of hamstring strains in elite soccer: an intervention study. Scand J Med Sci Sports 2008;18:40–8.
. Preventive effect of eccentric training on acute hamstring injuries in men's soccer: a cluster-randomized controlled trial. Am J Sports Med 2011;39:2296–303.
. The effectiveness of a neuromuscular prevention strategy to reduce injuries in youth soccer: a cluster-randomised controlled trial. Br J Sports Med 2010;44:555–62.
. Effect of 2 soccer matches in a week on physical performance and injury rate. Am J Sports Med 2010;38:1752–8.
. Hamstring muscle injuries in professional football: the correlation of MRI findings with return to play. Br J Sports Med 2012;46:112–17.
. Epidemiology of patellar tendinopathy in elite male soccer players. Am J Sports Med 2011;39:1906–11.
. Anterior cruciate ligament injury in elite football: a prospective three-cohort study. Knee Surg Sports Traumatol Arthrosc 2010;19:11–19.
. UEFA injury study: a prospective study of hip and groin injuries in professional football over seven consecutive seasons. Br J Sports Med 2009;43:1036–40. This web only file has been produced by the BMJ Publishing Group from an electronic file supplied by the author(s) and has not been edited for content. Contributors JE, MH and MW were responsible for the conception and design of the study. All authors were involved in data collection over the study period. JE and HM conducted the analyses, which were planned and checked with the coauthors. All authors contributed to interpretation of the findings and had full access to all data. JE wrote the first draft of the paper, which was critically revised by MH, KK, HM and MW. The final manuscript was approved by all authors. JE is the study guarantor. Funding This study was supported by grants from UEFA, the Swedish National Centre for Research in Sports and Praktikertjänst AB. Ethics approval The study design was approved by the UEFA Medical Committee and the UEFA Football Development Division. Provenance and peer review Not commissioned; externally reviewed.